Learn how to paint a rug in a pretty, geometric pattern with this Modern Geometry Mat tutorial from Lisa Nelsen-Woods. 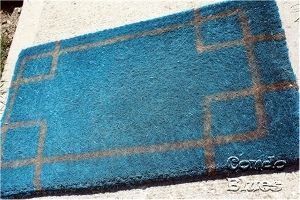 It makes a great welcome mat for a stylish homeowner. Place the coir doormat onto the drop cloth. Cut the painters tape into strips with the scissors. 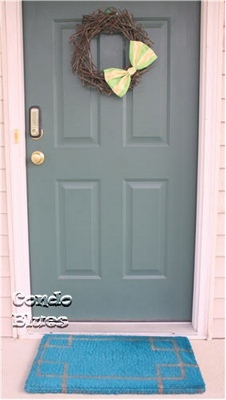 Create a design with the painter’s tape on the doormat. 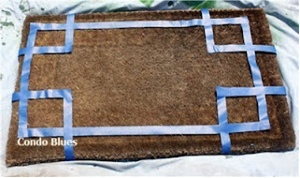 Evenly cover the doormat with one coat of spray paint and allow the paint to dry. Do not remove the painter’s tape. Evenly cover the doormat with a second coat of spray paint as needed and allow the paint to dry. Remove the painter’s tape from the doormat.